Whilst waiting for the arrival of the new wood fired boiler we need to prepare the storage tank and get the piping scheme worked out for the system. We’ve selected a 659 gallon 64×60 tank from STSS Co., Inc., with 3 heat exchanger coils: one dual coil for heating system input/output, one coil for the solar array, and one coil for domestic hot water. Since there’s a sump crock in the way, the tank needs to be placed on an elevated platform that allows it to clear the crock. The tentative piping system diagram is here. There are some challenges to managing the energy flow so I’ve decided to leave that to the control system software rather than try to do it all with mixing and zone valves. Note that there is a short loop that runs from the top of the wood gassification boiler around to the boiler inlet, with all zones taking heat off of this loop and returning to it. 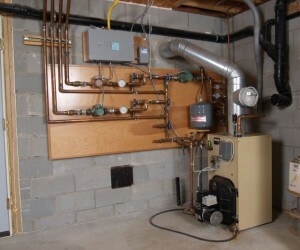 This is to minimize the temperature differential between boiler output and input, and to keep the boiler operating hot enough to avoid issues with flue gas condensation. This is of even greater concern with the EWB-100 since its stack temperature is considerably lower than the oil fired boiler we’re currently using. But of course the higher the ‘boiler’ loop temperature, the lower the efficiency, so there is a sweet spot to maintain, somewhere around 150 degrees. Once boiler output exceeds the house’s ability to absorb additional heat, the surplus heat is used to raise the temperature of the storage tank. Due to the construction of the tank, the maximum safe water temperature is 165 degrees F. The system will stop transferring heat to the tank when this point is reached, and should boiler loop temperature reach 180 degrees then the system will shut down the forced draft to the boiler, forcing it into idle condition. We’d like to avoid that condition, so as the boiler loop temperature passes 175 degrees all heating zones activate and excess heat is transferred to the house in an effort to keep the boiler from entering idle mode. The goal is to keep this scenario from ever happening (don’t load too much wood in the boiler!). Once the wood is consumed, the house heating demand has been met, and the system conducting heat to the tank detects that the boiler and storage tank have reached equilibrium, all circulators shut down. When a zone calls for heat, the boiler loop and tank loop circulators start up, along with the zone circulator(s). Heat now flows out of the bottom of the storage tank, since when it is being ‘charged’, heat flows into the top of the tank. The boiler loop along with the zone takeoffs can be seen in the above picture in the original system. The new wood boiler will be located somewhat to the right of where the oil boiler is located to allow more access to the left side (the oil boiler will be removed). Because of the height of the wood boiler, the spirovent and expansion tank must be relocated to a higher position. The storage tank takeoff loop will be added at that time as well.